Venus, arguably the most Earth-like world we know of, is an enigma. Despite decades of studying Venus from afar, and sending off probes to melt into metallic puddles on its surface, we still don’t understand why our nearest neighbor is a toxic hellscape. But scientists hope to change that, with a bold new mission that would bring a taste of Venus’ alien atmosphere back to Earth. At a Planetary Science Vision 2050 workshop hosted at NASA Headquarters in Washington D.C. earlier this month, James Cutts of the Jet Propulsion Laboratory and other members of the Venus Exploration Analysis Group (VEXAG) presented a concept for a future mission to Venus that would scoop up samples of the nearby world’s atmosphere, and deliver them to laboratories on Earth for analysis. While the mission doesn’t have a formal name yet, and is unlikely to launch until the 2040s, the technical challenge of diving deep into Venus’ caustic clouds to collect pristine cloud samples, then doing a U-turn to bring that precious cargo home, should keep engineers at NASA occupied for years. To Cutts, the payoff would be well worth the effort. In the case of our nearest planetary neighbor, the questions are legion, but there’s an obvious one that rises to the top of the pack: Why is Venus so unlike the Earth? After all, the two planets are roughly the same size, both featuring a central core, a molten mantle, and a rocky crust. They coalesced out of the same blob of gas and dust that encircled our young Sun. But while modern-day Earth has liquid water oceans, breathable air and a temperate climate, the surface of Venus is hellishly hot, thanks to a carbon dioxide-rich atmosphere roughly 90 times more massive than our own. Venus may have habitable eons ago, but today, it’s a twisted doppelgänger rather than a planetary twin. Some scientists think Venus represents what Earth will become, as our aging Sun grows hotter, causing the oceans to steam off into the atmosphere and triggering a runaway greenhouse effect. Studying Venus could offer a window into our planet’s distant future. More saliently to humans alive today, Venus could help us understand which of the so-called “Earth-like” planets beyond our solar system truly are habitable. “There’s a lot of interest today in Earth-sized [exo]planets—but they’re also Venus-sized,” Cutts said. “It’ll be very interesting to discern,” what makes a planet Earth-like, versus Venus-like. Which brings us to Cutts’ proposed Venus sample-return mission, whose goals include “understanding the atmosphere’s formation, evolution, and history,” according to a poster presented earlier this month. As currently envisioned, the mission consists of a small science payload attached to an “ascent vehicle,” that plunges into Venus’ atmosphere using parachutes to slow its descent, and heat shields to protect itself from burning up. It’ll be targeting the so-called “clement altitude,” a region of the atmosphere 50 to 60 kilometers (31 to 37 miles) off the surface, where pressures and temperatures are similar to those found at sea level on Earth. It’s a part of Venus we’re already somewhat familiar with—in the 1980s, the Russians flew two VEGA balloon missions there. The clement altitude has also garnered the attention futurists, who envision humanity colonizing it with sprawling cloud cities. “It’s kind of a natural starting place for exploratory missions in the atmosphere,” Cutts said. After the ascent vehicle’s heat shields and parachutes have been released, and once a few atmosphere and cloud samples have been scooped up at the target altitude, a propulsion system will kick in, and the precious canisters will begin their journey back into orbit. There, the ascent vehicle will rendezvous with an orbital spacecraft to hitch a ride back to Earth. Assuming we can overcome the hurdles, and deliver a few whiffs of Venus’ atmosphere back to our scientists on Earth, what do we stand to learn? “One thing, of course, is the Venus greenhouse effect and what controls that,” Cutts said, adding that only a small fraction of the sunlight hitting Venus’ surface actually makes it to the ground, with most of that solar energy reflected back into space by particles in the atmosphere. According to Cutts, there’s also an atmospheric phenomenon nobody understands: UV radiation is absorbed in distinct and ever-shifting patches of the sky. “It’s probably very complicated, and we’d have a better shot understanding the chemistry back on Earth,” he said. Like the lunar rocks and soil samples collected by Apollo astronauts on the Moon, samples of Venus’ atmosphere could, in theory, be preserved for decades, fueling future scientific investigations we haven’t yet imagined. Ultimately, an atmospheric sample return mission is a small fraction of what the VEXAG team hopes to accomplish at Venus. They imagine our nearest neighbor swarming with scientific instruments—orbiters doing high-resolution radar imaging, floating ballon missions that study the atmosphere for weeks to months on end, and battle-hardened surface landers that can handle the crushing pressures and temperatures long enough to collect useful data on the geology of Venus’ surface. Obviously, how much of this vision comes to pass depends as much on politics and budgetary considerations as it does on the scientific case for studying Venus, but right now at least, planetary exploration is one of the few areas of scientific inquiry that seems to be faring well in America. Two proposed missions to Venus made the final cut for NASA Discovery mission proposals in 2015, and although neither was ultimately selected for development, there are always future funding cycles. Beyond the United States, there’s growing international interest in our nearest neighbor: The European Space Agency and Japan both flew their first mission to Venus recently, and Russia is gearing up to send its first post-Soviet era orbiter and lander, called Venera D, in the 2020s. The road to understanding Earth’s terrifying twin remains long and daunting. But of all the alien worlds we can send off spacecraft to study, none stand to reveal so much about our own planet. 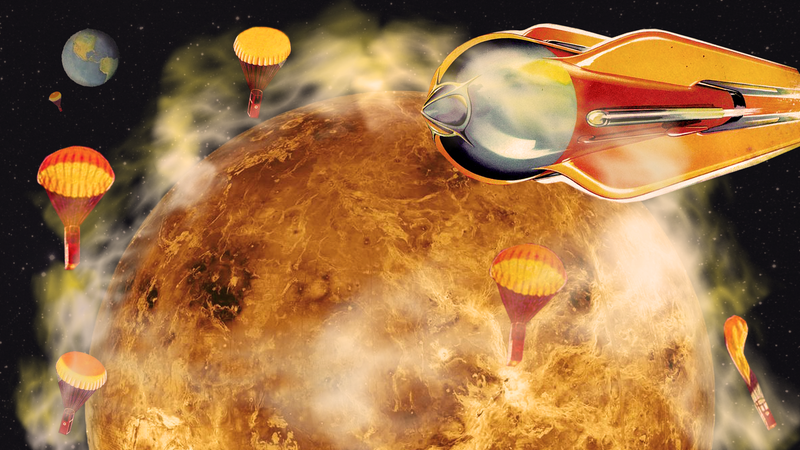 Self-interest, ultimately, could propel us to explore hostile Venus. Plus, getting to take a whiff of an alien world’s atmosphere? That’s just plain cool.